the underlying element shared by each Marquis is quality. Marquis says no two of its yachts are exactly the same, because they’re tailored to each customer’s preferences and tastes, with all kinds of different options. But the underlying element shared by each Marquis is quality. 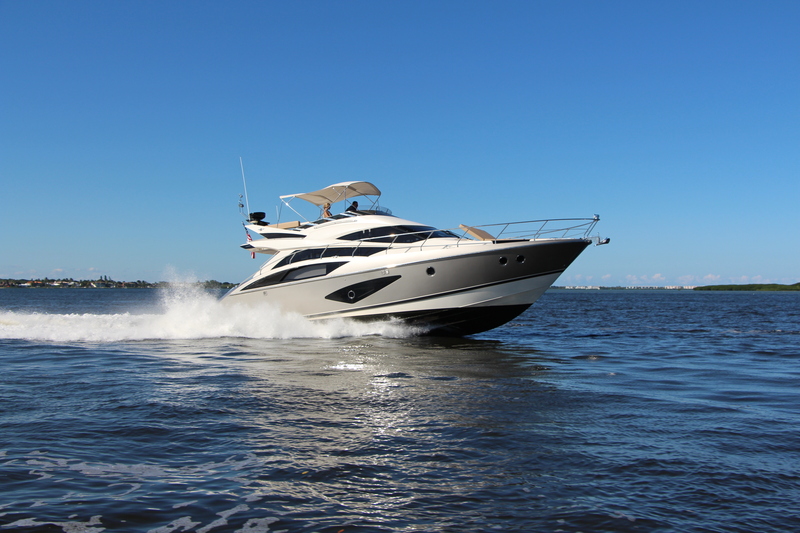 Marquis Yachts LLC is the Wisconsin-based parent company that builds both the Marquis and Carver lines of cruisers. The American-made Marquis 500 Sport Bridge is built in a vertically integrated yard, meaning just about everything on this boat is custom-made in-house. It features a mix of classic and modern lines, with large windows and a massive teak swim platform. In terms of performance, the 50-footer gets on plane in about 10 seconds. And when you push the three Volvo Penta diesel engines, the yacht is capable of reaching a top speed of 32 and a half knots, or 37.4 mph — not bad for a boat that weighs more than 20 tons. While up on plane, the 500 SB’s most efficient range is found at 3000 rpm, translating into 26 and a half knots or 30.5 mph. It rides well and exudes confidence through turns. Also, it just looks great under way. Passengers will enjoy the ride and have no shortage of options. 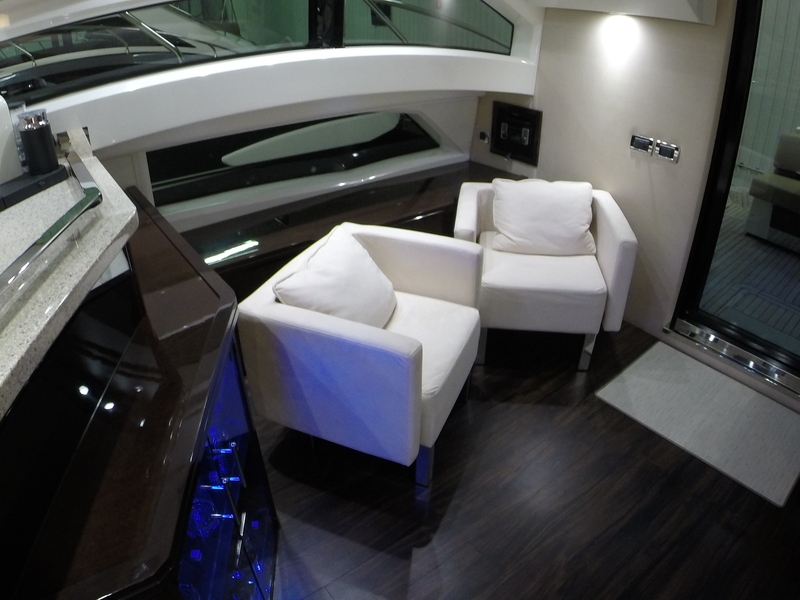 On the bow, there’s a large sunpad with cushions that lock into a chaise lounge-style position. At the stern, there’s a good-sized bench. With plenty of room back there you could easily add more deck chairs. Getting from bow to stern is made easier with high rails and walk-through access on both sides. The bridge is easily accessed by wide steps. That’s a nice touch and adds safety and convenience for boaters of all ages. The ample seating continues on the bridge. A wraparound bench surrounds a table. The port-side bench stretches all the way forward to the controls, so the captain in the adjustable chair can have company. The controls on the bridge are spread out, so you have everything you need within arm’s reach, but screens are large and controls and gauges don’t appear cluttered. 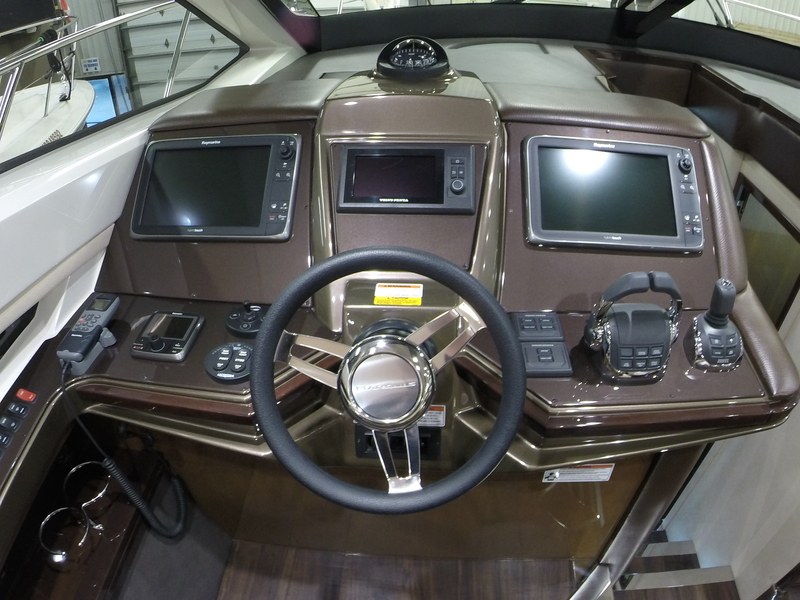 With triple diesels linked to IPS inboard pods, there’s joystick control, that makes docking this 50-footer a breeze. The wide-open bridge gives open-air access but the Bimini top that covers the controls and most of the bench seating gives relief from the sun and allows extended entertaining. Should you move downstairs, the entertainment value actually rises. Port-side, on this level, you find the exterior wet bar. A hideaway sink and grill with stainless steel lid are mounted above the fridge, icemaker and roll-out bottle-storage drawer. 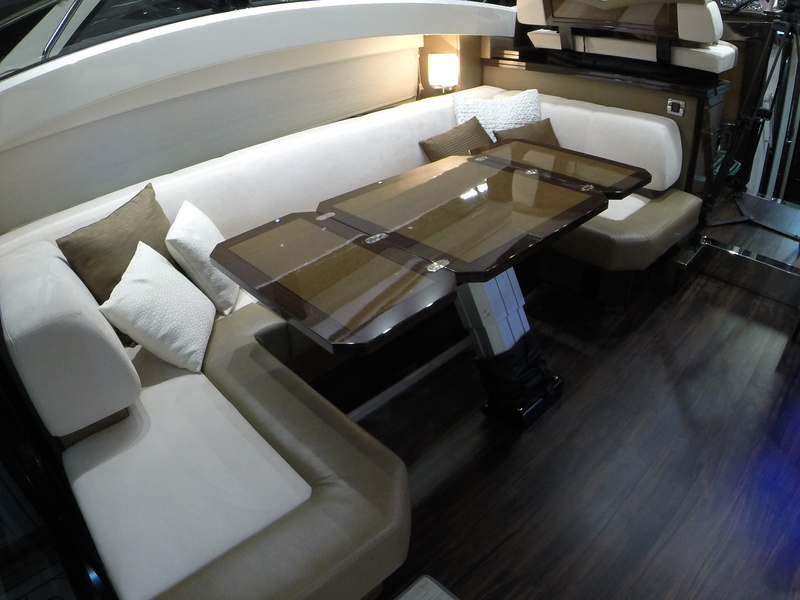 In a luxury yacht, why not have a luxury table? Moving inside, the salon’s port side has a two-tone bench with fold-out table. This owner of the test boat has opted for the automatic option. In a luxury yacht, why not have a luxury table? Flip another switch on the starboard side and a flat-screen TV appears, sliding up from its hidden berth in the cabinetry. For a different kind of entertaining altogether, there’s a bar with LED light accents taking pride-of-place in the centre of the room. Not quite as prominent, but easily accessed, are the electrical panels that blend into the overall design. They are hidden behind cherry wood cabinetry doors. Between the port-side bench and the helm is a cleverly designed pull-out shelving unit perfect for galley storage and extra dishes. The helm itself is well-designed and matches the look of the rest of the salon, while offering everything you have up on the bridge. Directly opposite is a full galley with stainless steel sink, dual stovetop and plenty of counter space, with storage and a fridge. For the cooks on board, there’s a microwave-convection oven. Belowdecks, there is a lot of living area packed into a limited space. Still, the doors to all three staterooms are high enough for a six-footer to walk through without ducking. 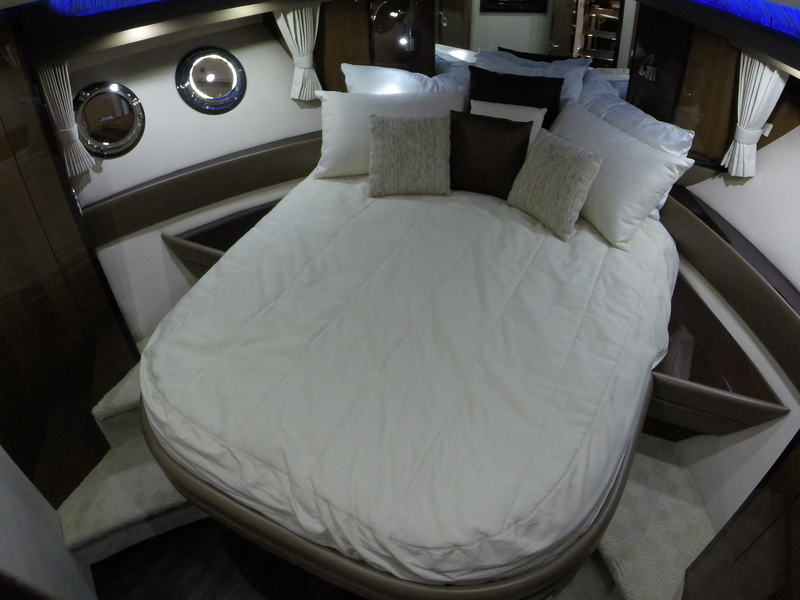 Lots of wood and LED lights accent the master suite, complete with hanging lockers, multiple portholes and a queen bed. Underneath the bed, two large drawers provide storage for clothing or bedding. The ensuite head is spacious and features a full-size shower with teak inlays. 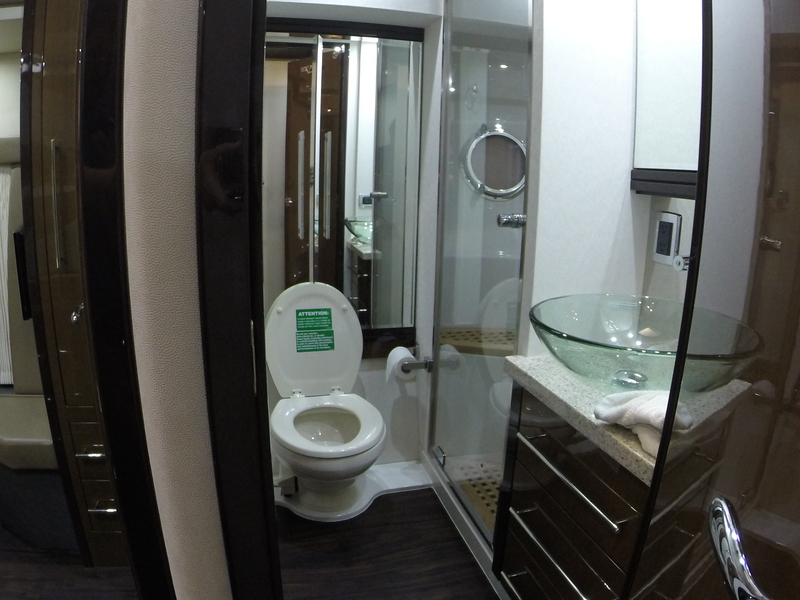 The primary guest stateroom on the port side features a queen-sized bed and has a massive window with porthole vent. It too has a hanging locker, storage under the corner stool and multiple drawers. There’s direct access – and hallway access – to the guest head, which has its own shower, stylish glass sink and more drawer storage. Across the hall, the secondary guest stateroom has two twin beds and a large window with a porthole vent. The washer/dryer unit is located here, disguised by more cherry wood cabinetry. The expert design work continues down in the engine room. 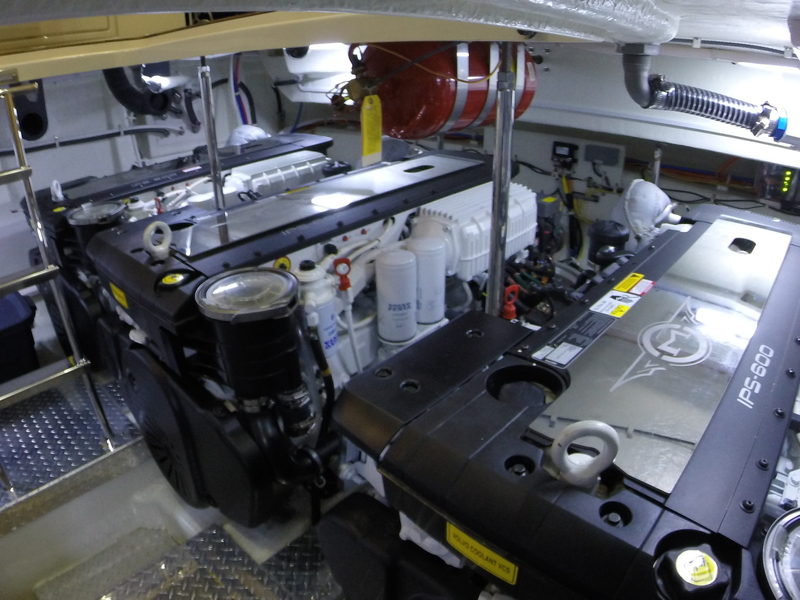 Even with so much room taken up by luxurious living space, there’s plenty of room for the three Volvo Penta diesels and any work you need to do on them. With powerful triple inboard propulsion, inspired design, and great comfort, this Marquis 500 Sport Bridge is truly what luxurious yachting is all about. This boat is featured in the Winter 2015 issue of Boats&Places as well as in episode 12 of the 2015 Season of PowerBoat Television.